These days school security systems consist of a little bit more than just a truant officer of the 1970's and before. Thanks to always evolving technology and reduced prices, a digital video security camera system usually plays a big part in school security systems as well as maintaining order within the classroom. These days school security systems consist of a little bit more than just a truant officer of the 1970’s and before. Thanks to always evolving technology and reduced prices, a digital video security camera system usually plays a big part in school security systems as well as maintaining order within the classroom. Many schools have gone to total digital video with a camera with audio in every room. This provides superior documentation in the event of a student disturbance. Likewise, the “camera in every room” policy can not only protect teachers but can protect students as well especially by documenting teacher-student situations as they occur. The whole idea of installing a digital video camera in every classroom is not as far fetched as it may seem. After all, before the advent of cheaper yet higher quality digital video systems, most schools used an older method of communication; the intercom. Today, we have the advantage of disposing of the intercom and using the digital video school security system. Not only can the school’s front office communicate with the teacher (or student) in the room via two-way audio, but a video image can be seen at the same time. Should there be any doubt as to an altercation between two students or between a student and teacher, the entire episode is captured and recorded on the Digital Video Recorder or DVR which is usually located in the front office. 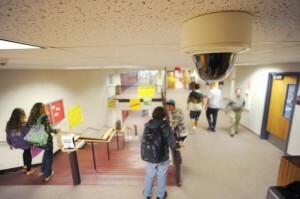 There are a variety of digital video camera security systems that can be used as school security systems. Security Camera King has an ample supply of equipment and down-to-earth reasonable prices. To equip a school properly, all rooms should contain at least one camera. This includes the cafeteria, gymnasium, band room, as well as each class room. Typically, Security Camera King’s complete 32 channel Elite DVR security camera package will do the job. If 32 cameras are not enough to adequately monitor the school, then more (4, 8, 16, or 32 camera) systems can be added until the optimum number is achieved. Security Camera Kings 32 channel system is particularly useful in this situation. First of all the unit comes with 32 420TVL infrared cameras. This means you get 24/7 full coverage. During the daylight hours the camera captures highly detailed color video and at nighttime when school is over for the day and the lights are out, the infrared (IR) technology is automatically switched on and video camera coverage continues. However, it is not necessary to use all of the same cameras for the entire system. For example, if you want to include surveillance of a parking lot, you could upgrade a camera to a Pan-Tilt-Zoom (PTZ) camera. A PTZ camera is an incredibly versatile camera that allows the user to move the camera horizontally (Pan), vertically (Tilt), or zoom in on an object. In addition a PTZ camera usually has the ability to track and follow objects such as people and vehicles. This would provide a good handle on who is approaching the school from the outside. 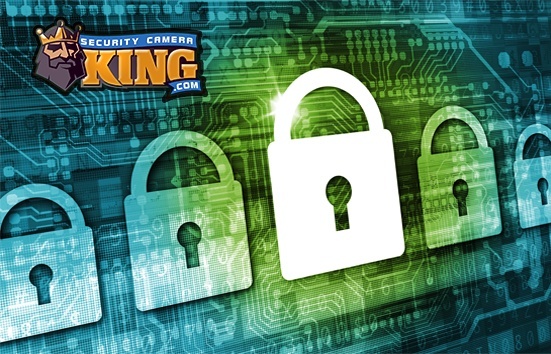 All of Security Camera King’s DVRs are internet ready, so when installing your system, don’t for get to supply the DVR with an active Ethernet Cat5 cable. Once connected to the internet, the principal, superintendent, maintenance personnel and any one else as necessary can be set up to monitor the entire system remotely from their smartphone. Security Camera King’s school security systems are designed to be easy to install, so easy that a maintenance employee should be able to install the system with absolutely no problems. However, should some sort of difficulty occur, our support team of security experts are readily accessible to help you every step of the way. In fact, our security experts can be contacted on-line by using “Live Chat” or by telephoning 866-573-8878 Monday through Friday from 9AM to 6PM EST. They will walk you through every step of the process from the very beginning to the very end, if need be. They’ll even help you design your system to determine what kind of equipment, how many cameras you’ll need, and so on. So if you’re looking for a solution for theft, burglary, vandalism, bullying, student discipline and documenting student to student or student to teacher behaviors a school security system sounds like just what the doctor ordered. We’d love to help you upgrade your school security system, so please, contact us today.